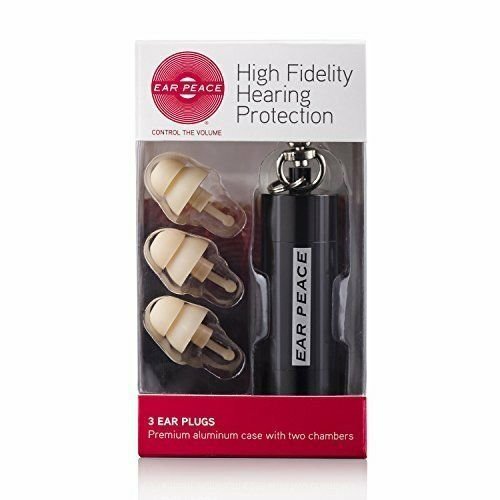 EarPeace high fidelity hearing protection are the best best ear plugs for your loud entertainment experience. Our original model, they are precision engineered to comfortably deliver superior sound-quality. You get great sound at a lower volume and the background noise is filtered out. You will forget you're even wearing them. Developed for the loudest shows, clubs and festivals, EarPeace is the must have accessory for your live entertainment experience. Why use EarPeace? Great sound: You will actually hear better when you wear EarPeace at a loud event. The attenuation filters allow a precise amount of unobstructed sound to enter the ear - turning down the volume without distorting the sound. The music is crisp and you'll leave without your ears ringing. You'll even be able to speak with your friends! Comfort: You can wear EarPeace comfortably for hours. You can even sleep in it. It's made out of soft, safe, hypoallergenic silicone. It's reusable and strong. The tab feature lets you get it in and out of your ear easily. Style: EarPeace is so discreet it is virtually invisible. No one will know you are wearing EarPeace. The two chamber case is ultra premium and newly upgraded. EarPeace something is something you will want clipped to your key chain. PROFESSIONAL HEARING PROTECTION: EarPeace turns down the volume without distorting the sound. These high performance ear plugs deliver crisp, clear sound at a safe volume. COMFORT: You will hear and feel better when you use EarPeace. Made from soft, medical grade silicone so comfortable you'll forget you're wearing them. Universal fit, reusable and hypoallergenic. VIRTUALLY INVISIBLE / DISCREET: EarPeace comes in multiple skins tones and disappears in your ear. These ear buds are the required accessory for your party or gig. PREMIUM VALUE: Three chamber, milled aluminum case keeps your 3 EarPeace ear plugs safe and clean. Precision engineered, medium and high protection filters give you protection options and industry leading performance. INDUSTRY STANDARD: Metallica / Lollapallooza / RedBull carry EarPeace as their merchandise because we make the highest quality hearing protection. Don't be fooled by cheap imitations. If you have any questions about this product by EarPeace, contact us by completing and submitting the form below. If you are looking for a specif part number, please include it with your message.